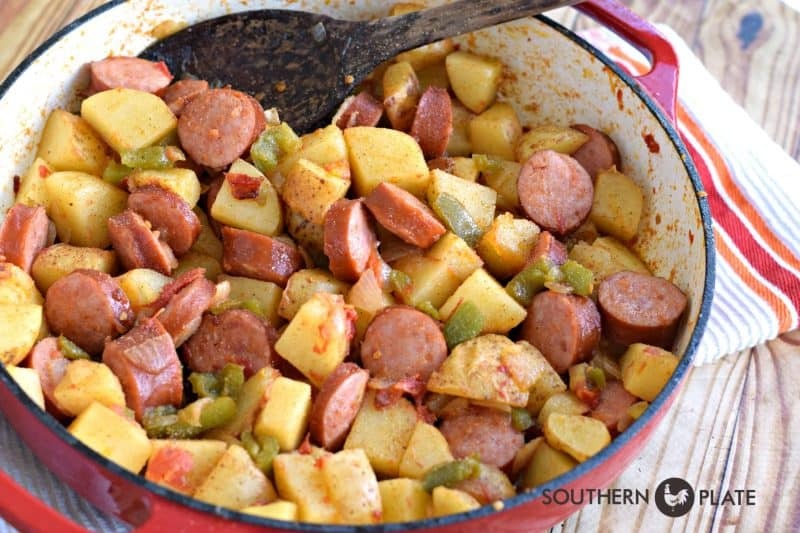 Simple & Delicious Kielbasa Skillet is one of those recipes that is really more of a concept than a recipe because you don’t *have* to have a certain vegetable or certain amount of any one veggie. You don’t even have to have polish sausage, you can use weenies instead even use those little faux weenies, the vegetarian or soy ones if you like. I use Turkey Kielbasa these days. No matter what you have on hand and end up using, this skillet is hearty and full of flavor – and that’s why I love it. I made the pictured dish this past Sunday in the afternoon and then divided it into individual containers to put in the fridge for lunches and breakfasts in a hurry. The ingredients I’m using today are pretty standard for me: Potatoes, bell pepper, tomato, onion, kielbasa (I prefer turkey), and Season All. You’re also going to need a little bit of vegetable oil. Now Season All is a big player in this dish. It’s a great all purpose seasoning that is surprisingly cheap (I even use generic brands and like them just as well) that contains salt, chili pepper, black pepper, celery seed, onion powder, paprika, garlic, etc. It’s great for pretty much all things, thus the name. A lot of people run around squawking* about how they would never use Season All because it has MSG but it doesn’t. It even says so clearly on the bottle: “No MSG”. I don’t know if it used to have MSG or not (I have no serious issues with MSG) but I know it sure doesn’t now. Like I said, the name brand (Morton) is a great one but I pick up bottles of generic Season All pretty often and like them just as well. I believe this big bottle costs around $2.00 and I use the mess out of this stuff. *Squawking – the act of going around complaining about a problem with a product that doesn’t actually exist. To start with, pour a little oil in your skillet. This is probably about four tablespoons. You’re gonna need this to help get those potatoes cooked. Put this over medium high heat. Wash your taters and chop them up. I don’t peel mine but you can if you really want to. Those skins have lots of good stuff in them and I like having them on there. Cook these for about ten minutes, stirring often. Add all of your other vegetables, which you chopped right skippy like while your taters were cooking because you’re all efficient with your time like that. Stir that up and let it cook for about another five minutes or so, stirring if you think about it every now and then. At some point you want to generously sprinkle the top of that skillet with Season All. I probably use about a tablespoon or so, all told. It’s up to you. You can always add more if you want to but don’t be afraid to be generous because this is good stuff! 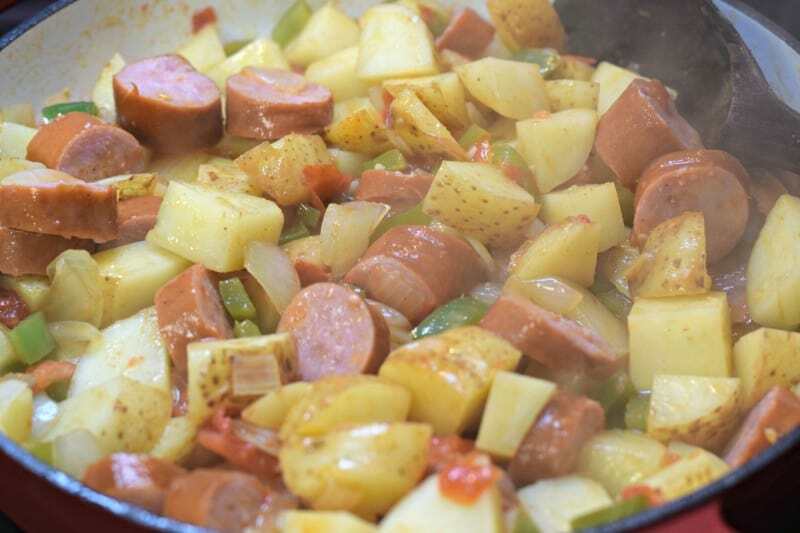 After my potatoes start getting close to tender, I scoot everything over to one side of the skillet and add my sliced kielbasa and let it get good and hot, even a little browned on the bottom if I feel like taking the time to do so. Stir that up kindly good and then let it continue cooking until the potatoes are fork tender. I usually turn my heat down to medium low and employ a fancy skillet cover in the form of a dinner plate to let the potatoes steam a little bit. Look how pretty! Now sprinkle this with some more Season All. Serve warm. Serve cold. Just sit down and eat! This makes a great supper, breakfast, lunch, brunch, or linner and is great to eat at the table, in the recliner, on the porch, or even in the car if you have the good sense to call shotgun! 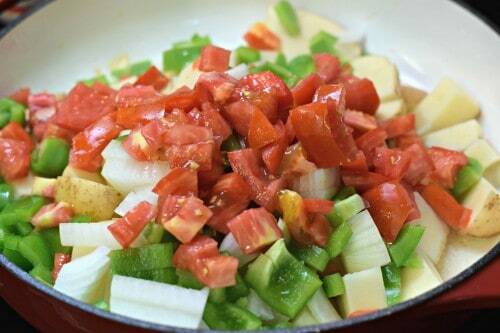 Please oil in large skillet and heat over medium high heat while chopping vegetables. Cut all vegetables into bite sized pieces. 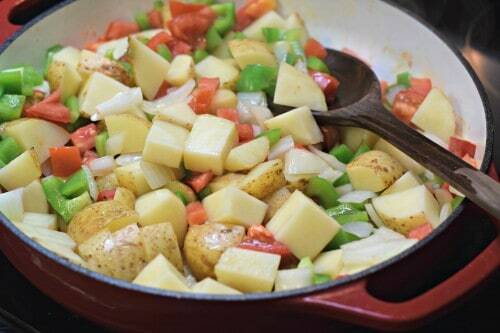 Add potatoes to skillet and cook, stirring often, about ten minutes. Add all other vegetables and a generous sprinkling of Season All. Stir and cook another five minutes. 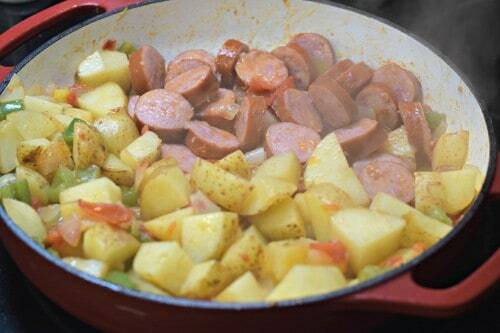 Push veggies to the side of the skillet and place sliced kielbasa in empty side. Cook, stirring every now and then, for about five minutes. Stir contents of skillet together, and generously sprinkle with Season All again. 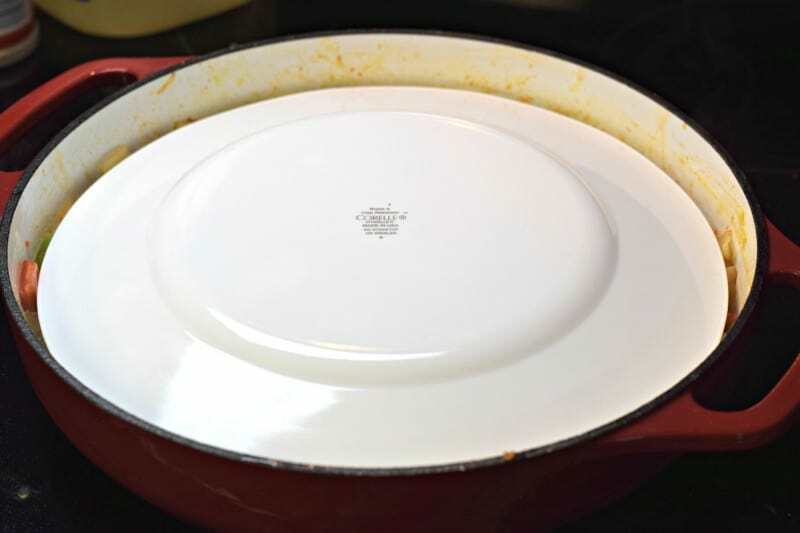 Cover with a lid or large dinner plate and reduce heat to medium low. 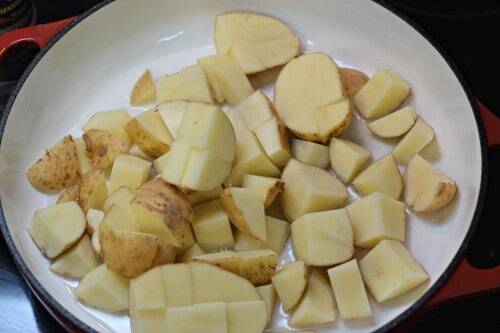 Cook until potatoes are fully tender, 5-10 minutes more. Sprinkle with more Season All if you like (I like!) and serve. Please note, I am only telling you the measurements I used this time. I change this up all the time so consider this recipe a general guideline. The only thing I recommend doing is using a good bit of Season All or seasoning of your choice. That combined with the onion, sausage, and pepper really gives it a wallop of flavor but feel free to make it your own. ~Tom Peters. Submitted by Cathy Kelley. Click here to submit your favorite quotes. I have also been making this for years- my family loves it. In a pinch use bagged frozen obrian hash browns. It is also good with cooked tortellini in place of potatoes. The frozen ones cooked, then added works best. Great idea Missy!! Thanks for sharing!! I made this all the time. My boys grew up on it. i made this and asked my husband to put in the seasoning and he got the wrong spice and used ms.dash italian meadley instead but it turned out greatttttttttttttt. want to try with season all next time. sure it will be great with the right seasoning. Christie: That kielbasa skillet dinner looks absolutely delicious! 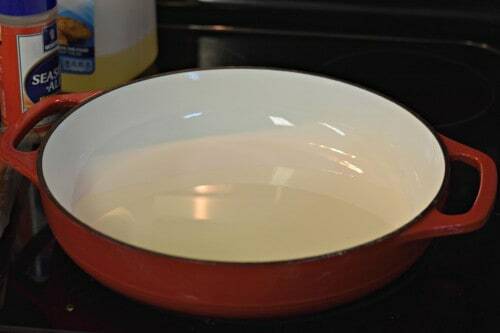 Love that red skillet; is it cast iron with a white ceramic interior? Who makes it and where can I get one? Thanks. 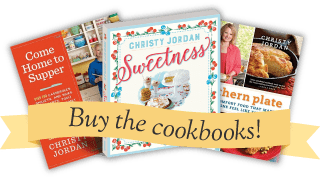 Love all your recipes; so glad I found your entries. I’ve been making this for years too. It’s especially good when the veggies are picked fresh from my own garden. Fresh from the garden are the best aren’t they?! Christy,this looks so good and I like that it is a fast meal to cook. I know my husband will like it and me to of coarse. I think a salad would be fine to have with it to if you like. I am so thankful I have found out about you and you are a suburb cook. I have tried several of your recipes and they never fail. Thanks Christy you are the best.. Thank you so much Barbara, you are too sweet!!! I hope you enjoy the dish!! We made this last eve and added a 8oz can of spinach. It is one of those recipes you have low expectation of and then you have to adjust your thinking after the first bite. Next time we will make with Tennessee Pride hot bulk sausage just to have another option. Not eating white potatoes right now so this would be excellent with cut up sweet potatoes. Love kielbasa any way you fix it. Always enjoy your recipes with everyday items in the pantry. Enjoy your website and recipes. Thank you so much Winnie!!! I want to make this dish – in fact, needed an idea for supper tonight. Howevrr, I cant eat tomatoes due to acid reflux. Ok, no problem to omit the maters. But , my picky hubby doesnt like bell pepper! ! Any good ideas for dubs and still taste good? I add frozen peas to mine. You might like to change it up a bit and use frozen corn or carrots. Tastes good and gives a lot of color. This dish goes great with cole slow. You could try zucchinis and mushrooms and/or bean sprouts. I have been making a dish similar to this for years. My recipe did not include tomatoes, but that sounds great to me. My grandkids love it and fight over the leftovers. I would love to hear what you think about the addition of tomatoes if you try it Jane!! This is an awesome dish. Definitely a keeper. Quick and easy. A-1 according to my family. Had it with Jiffy corn muffins. Hi Christy, For years, I’ve used these exact same ingredients (sans the tomatoes, add carrots) to make a tasty stew. The order of operation is somewhat reversed: I brown the sliced Kielbasa in a little vegetable oil, then add chopped onion and cook until translucent. Add chicken broth (or water), followed by cut up potatoes & carrots. Season with salt & pepper and garlic powder. (I’m sure Season All would be wonderful, too.) 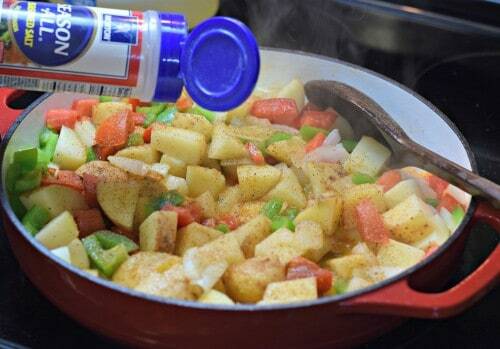 Cook until the potatoes & carrots are tender, then about 15 minutes before serving, add chopped green bell pepper. Goes great with cornbread or homemade biscuits. Comfort food for those chilly days coming up! This was delicious – even when using what I had on hand (no tomato, Jane’s Krazy Mixed Up Salt for Season-all and Mild Italian Sausage for Kielbasa). Loved it – we thought scrambled eggs as a side would make a perfect breakfast-for-dinner meal. So glad you liked it Michelle!! Isn’t it great how easy it is to change up? Hi Christy. 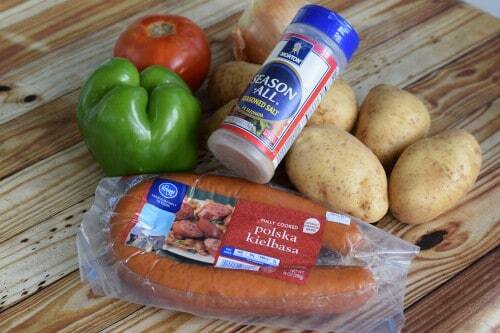 I made this for dinner last night using turkey kielbasa and it was terrific. After having two large servings, my husband announced his plans to have the leftovers with eggs tomorrow morning, (Saturday). Thanks for yet another delicious and easy recipe. Have a great weekend, Christy! Christy, Just want you to know that I take this same recipe, add broccoli, and your Price’s Pimiento Cheese mixed with a little cream to make a sauce from another recipe and pour over the whole shebang. My husband can’t have it often enough! Oh WOW!! I am going to have to try that, thank you for sharing!!! Christy, my husband makes this with kielbasa, cabbage and banana peppers. It’s very good but has some heat to it. We love it! It’s very good without the tomatoes and green pepper but with green beans instead. Just the sausage and potatoes with onions is the way my Mom used to make it. Yum! I hope you get the chance to try it soon!! Made this tonight and it came out amazing, I did use jalapeno sausage and added random spices. One of the best meals I have made in a while, I don’t mind eating leftovers. I am so glad to hear that you liked it!!!! Thanks for coming back and letting me know!! I just finished making this and waiting for my husband to get home from work to try it. I do hope he likes it as it is a super easy supper. I love recipes that you make one time and then never have to look at a recipe again because all ingredients are so easy to remember. I have a few dishes that I call my go to meal with simple ingredients and no fancy preparations. I agree Karen, those are the best meals!! Bonus point for using only one pan!